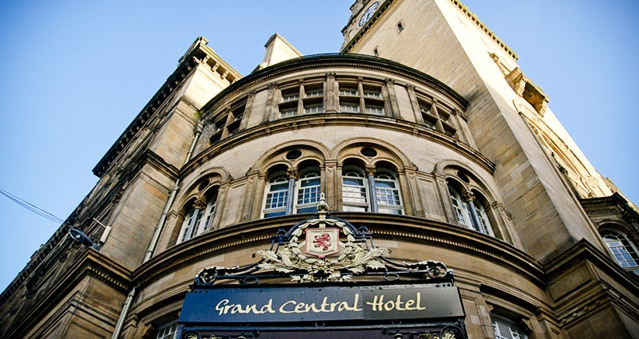 In the heart of Glasgow is an award-winning city icon, The Principal Grand Central Hotel, Glasgow. The hotel is just steps away from Glasgow Central Station. In the heart of Glasgow, adjacent to Glasgow Central Station stands the historic Grand Central Hotel, winner of 4 awards at the Scottish Hotel Awards 2015 including Gold Laurel Award. A much-loved icon in the city, the hotel has undergone a £20 million refurbishment transforming it into one of Glasgow’s most stylish, conference, training, wedding, banqueting and short break destinations and once again takes its place as Glasgow’s leading four-star hotel.